To make your own poached chicken breasts for this recipe, see the Note below the recipe. Otherwise if you shred the breasts and thighs of a purchased rotisserie chicken you should end up with about the right amount for this recipe. If I use rotisserie chicken for a chicken salad, I simmer the bones, skin, and wings in some less-sodium chicken broth to make an enriched stock to use later in a soup. This chicken salad is great in a deli roll, or piled on top of a salad. It will keep in the fridge for up to 4 days. In a large bowl combine the mayonnaise, vinegar, pureed chipotles, thyme, salt and pepper. 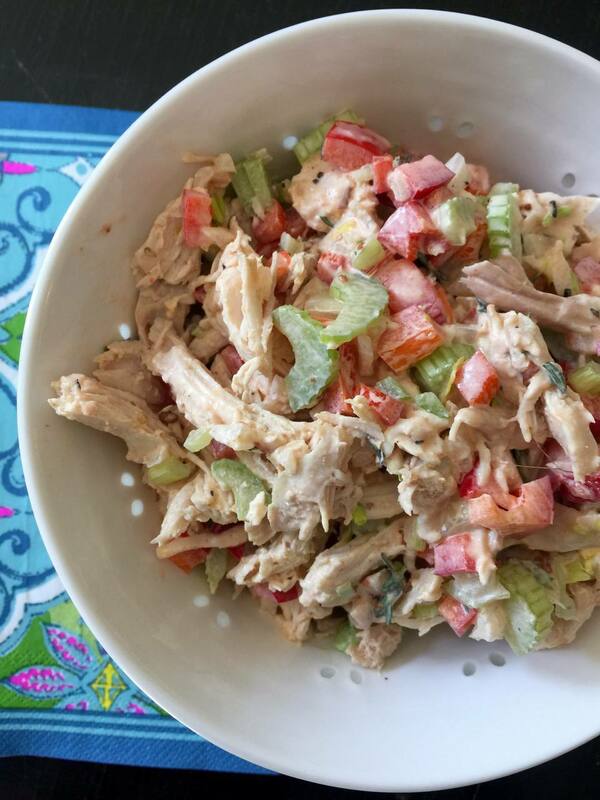 Stir in the celery, onions, pepper and chicken until the chicken salad is well combined. Serve chilled. To make pureed chipotles in adobo sauce just dump a can of them into a food processor and bend until combined. This will keep for week in a covered container in the refrigerator. Scoop out teaspoons or more to bring a bit of smoky heat to all kind of soups, stews, sauces, casseroles and dressings. If you want to use low-sodium chicken broth instead of water you will end up with a rich stock that can be used in soups and other recipes, and the chicken will have even more flavor. Pick seasonings to cook the chicken that will complement the finished dish. Place the chicken and add-ins in a pot: Arrange the chicken in a single layer on the bottom of the pot. It's fine if they overlap a little, but they cook more evenly if they are in a single layer. Scatter the salt and seasonings over top. Cover the chicken with water: If using wine, pour this over the chicken first. Pour in enough cool water to cover the chicken by an inch or so. Bring the water to a boil: Place the pot of chicken on the stovetop over medium-high heat. Bring the water to a boil. You'll see some white scummy foam collecting on the surface as the water comes to a boil — if you'll be using the poaching liquid for a soup or other recipe, you can skim this off; otherwise, it's fine to leave it. Reduce to a simmer, cover, and cook: As soon as the water comes to a boil, reduce the heat to low, cover the pot, and let the chicken simmer. Begin checking the chicken after 8 minutes: it is done when opaque through the middle and an instant-read thermometer in the thickest part of the meat registers 165 degrees F. Chicken will typically finish cooking in 10 to 14 minutes depending on the thickness of the meat. Remove from the poaching liquid: Remove the chicken from the poaching liquid and place it on a cutting board. Serve or store the chicken: Poached chicken can be served hot, room temperature, or cool. It can also be served whole, or it can be sliced or shredded as per your recipe.